"I have spent the last four years watching people die." This is how Stephen Lewis, the UN Special Envory for AIDS in Africa begins this brilliant book. The book, is a personal account of Stephen Lewis and his experiences in Africa. He is honest, blunt, humorous and pulls no punches. This book is the story of Africa's plight and the wealthy world's betrayal. Much of the book recounts the Millennium Development Goals set by global leaders in 2000 that promised the poor such essentials as primary education, basic health and a reversal of AIDS by 2015. In this book Lewis shows why and how the promises can't be kept, probes the appalling gap between vision and current reality and offers some pathways to attainable solutions. I too have been profoundly affected by those suffering from HIV/AIDS. In early October 2005 I spent 10 days in Kenya and Malawi mostly with people dying of AIDS. One day we did "home visits" in a Malawi slum. 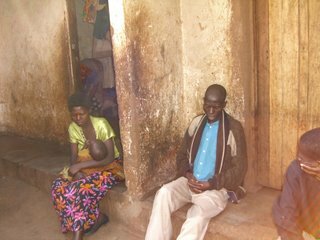 Our group visited about 20+ homes of people who were dying of AIDS or who had family members dying of AIDS. Within two weeks more than 10 of the people we had visited had passed away. I returned from this trip to Malawi changed in profound ways. I have been to more than 30 nations of the world, have spent much time with the poor, but never have I been affected by a trip like this one. Since the October trip I have continued to think about how I should respond to what I experienced. I have responded in a number of ways. In March I worked on a celebrity basketball game that raised more than $50,000 for an AIDS clinic in Malawi. In April, May and June 28 people returned to Malawi to work with those infected and affected by HIV/AIDS. I plan on returning to Malawi in November. However, I am quite convinced that my involvement must go deeper than simply taking a few trips, writing a book and working on fund-raising events. What that will ulimately mean for me I'm not sure. At any rate, you need to read Race Against Time. It is an excellent book that will give you an understanding of global issues related to AIDS that is crucial for understanding the related issues. I stumbled across your blog after stumbling across your flickr albums... I spent 1.5 years in Malawi, and 6 months working for Perry as PIH geared up to transition to the new clinic. I was thrilled to see the photos of the new facility, as I got to walk through when Perry was still deciding if the building was really what God had in store for PIH. Mostly, I wanted to just say that I think that it is incredible that you have traveled to so many places and are choosing to spend time to follow your heart on some big tough issues. Thanks for making your stories and pictures available for those of us who'd love to be traveling on your coat tails.